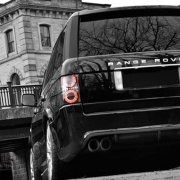 The new Project Kahn Range Rover RS500 Cosworth is a complete collaboration of British engineering (the good kind). 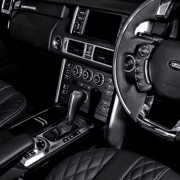 The conversion starts out as a Range Rover Sport powered by a twin-turbocharged 4.4-liter diesel V-8, and is then transformed by the legendary British engineering company, Cosworth, and given exterior and interior refinements by Kahn Design. 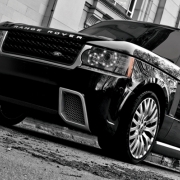 The result is a classy, unique, and bold SUV, churning out 500 ponies. The exterior design of the RS500 is sleek, stylish, and stunning. The new ten-piece aerodynamic body kit focuses on making a statement, and has been designed by the company’s owner and designer, Afzal Kahn to ensure the utmost in perfection and quality. The kit is comprised of a new front bumper with billet steel surrounds for the fog lamps to contrast the exterior paint. 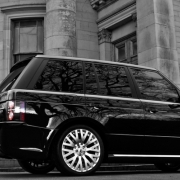 New side skirts along with matte black double-mesh side vents give the Range Rover a smooth, polished look. The rear features a new bumper with integrated exhaust diffuser that houses the quad Cosworth exhaust system. The elegant and stylish appearance of the RS500 Cosworth is further enhanced with new Project Kahn wheels. The 22-inch RS-X wheels are designed and manufactured using state-of-the-art technology to create a sculpted and dynamic design to match the new aerodynamic bodywork. The RS500 has power with its looks alone, but even its commanding presence cannot outshine its diesel powerplant tuned by Cosworth, the legendary British engine maker. While Project Kahn remains mum regarding exactly what Cosworth has modified, the end product is a muscular 500 brake horsepower. The entire upgrade comes with a numbered plaque signed by Chief Cosworth Engineer Bruce Wood, and a hand-made enamel trunk badge. 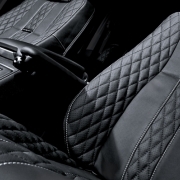 The interior also receives the Project Kahn and Cosworth treatment. 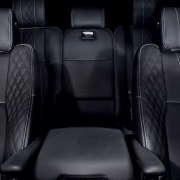 The front and rear seats, glove box, and dashboard are all dressed in new, custom-tailored quilted leather, with the seats receiving an embossed Cosworth logo. The speedometer, rev-counter, and clock all wear a new electric blue face, contrasting the interior leather. The steering wheel is also new. Manufactured in Italy, the wheel is made of machined billet aluminum and leather with contrasting silver stitching for an unmatched feel. The interior is finished with stainless steel door entry sills, side vents, and foot pedals for that sporty atmosphere. 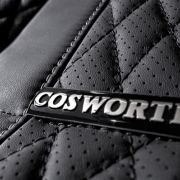 Even the smallest of details is not forgotten with the conversion, as owners are given a Cosworth leather key ring. 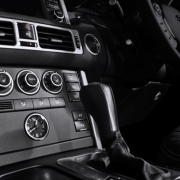 The entire Range Rover Sport RS500 program including the Cosworth engine upgrade can be purchased as a complete package or as individual components. The Cosworth engine upgrade comes standard with a 12-month/15,000-mile warranty. 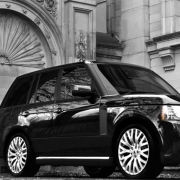 For pricing and information contact a Project Kahn sales representative by calling 01274 749 999. What is your favorite part of the Project Kahn RS500? The Cosworth-powered engine, the luxurious interior, or the stunning bodywork? Leave a comment and let us know!